Eleanor Anderson, widow of the composer Leroy Anderson, died November 12, 2014 of natural causes at her home in Woodbury, Connecticut. She was 96. 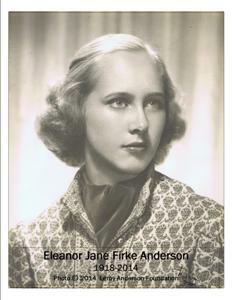 She was born Eleanor Jane Firke on May 21, 1918, in Champaign, Illinois, the daughter of Beulah Hubbard Firke and Atty. Charles Wesley Firke. Charles W. Firke graduated from the University of Michigan Law School. He became Illinois State's Attorney for Piatt County and also worked as legal counsel for the Illinois Central Railroad. His wife Beulah Hubbard Firke was a nurse. Eleanor Anderson was German on her father's side, the Firke side. On her mother's side, she was Scots through her maternal grandmother whose name was Anderson from Scotland. She was also English through her maternal grandfather who was a Hubbard. 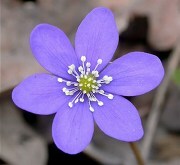 Although Eleanor was born and grew up in Illinois, her Hubbard ancestors came on one of the early boats from England. They lived in Massachusetts through the 1600s and 1700s until our ancestor followed a religious leader and wound up in the Midwest. 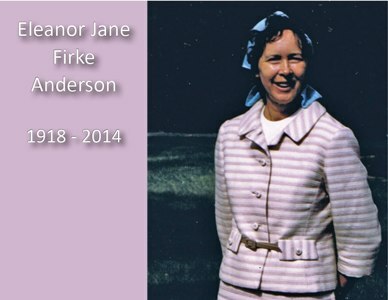 Eleanor Jane Firke grew up and went to school in Monticello, Illinois. She attended Connecticut College in New London, Connecticut. After her father's sudden accidental death in 1938, she transferred to the University of Illinois at Urbana-Champaign and graduated in 1939 with honors in English. She moved to New York City to attend the Tobe-Coburn School for Fashion Business. She met her future husband, Leroy Anderson, a musician, arranger and composer, at International House in New York City. 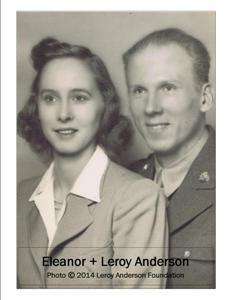 They were married October 31, 1942, at Grace Episcopal Church in New York City, a few days before Anderson, who later became a Captain in the U.S. Army, was sent to Iceland as an intelligence officer, fluent in nine languages. When Anderson was assigned to the Pentagon as chief of the Scandinavian Desk for Military Intelligence, they lived in Arlington, Virginia. After World War II ended, the family moved to Cambridge, Massachusetts to live with Anderson's parents and then to Brooklyn, New York. In 1947, they spent the summer in Woodbury, Connecticut, in a little cottage on 90 acres of land on Painter Hill Road owned by Mrs. Anderson's mother and her two unmarried sisters, Eleanor Hubbard and Marie Hubbard. It was here that Anderson composed his most popular piece, Sleigh Ride. In 1949, the Andersons moved permanently to a house that had been converted from a barn on the same property and moved 100 feet to the foundation of the former house. In October 1953, the family moved to a newly built house on Grassy Hill Road in Woodbury where Mrs. Anderson lived for the rest of her life and where her husband died at age 66. In contrast to her musically accomplished husband, Mrs. Anderson could not carry a tune or play an instrument. She recalled that as a student in Monticello, Illinois, she played E-flat alto horn in the high school band, "but it was just a few notes here and there like the last two beats in a waltz." I didn't have enough of a musical background to talk with Leroy about what he was doing," she said, but she was always his most tireless promoter and supporter. Mrs. Anderson was a long-time member of the Waterbury Symphony Orchestra Board of Directors. She was active in the Alliance Française, the Pomperaug Valley Garden Club and Flander's Nature Center's wildflower trail committee. For more than 60 years, she was a member of St. Paul's Episcopal Church in Woodbury, Connecticut. 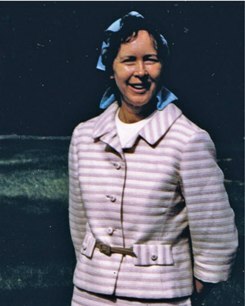 She was predeceased by her husband in 1975 and her son, Eric Anderson, in 2007. She leaves sons Rolf Anderson of Montgomery, Vermont and Kurt Anderson of Roxbury, Connecticut; daughter and son-in-law Jane and Peter Vercelli of Thompson, Connecticut; grandsons Anders Vercelli and Lars Vercelli, both of New York City, and Ivan Anderson of Junction City, California; nephews Mark Anderson and David Anderson, both of Woodbury; and three great nieces. Her funeral was at St. Paul's Episcopal Church, 294 Main Street, Woodbury, on November 22 at 1 p.m. Members of her family participated in the service that was attended by 125 friends and family members. Daughter Jane and family friend Jaroslav performed the prelude music on violin from the choir loft. Son-in-law Peter Vercelli, nephew Mark Anderson and great nieces Larissa, Keira and Alexa Anderson gave readings from the Holy Bible. Grandson Anders Vercelli, played Leroy Anderson's Forgotten Dreams on piano. He was accompanied by grandson Lars Vercelli and his wife Laura Vercelli who sang the lyrics to Forgotten Dreams. Daughter Jane vercelli, son Rolf Anderson, and grandson Ivan Anderson each gave homilies of Eleanor Anderson's life. Eleanor Anderson was buried in the family plot at New North Cemetery, 101 Washington Avenue, Woodbury, Connecticut. A bagpiper performed three pieces ending in Scotland the Brave. A reception at St. Paul's Church followed the burial.